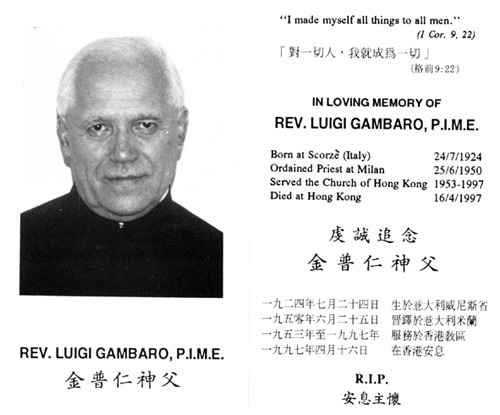 Father Luigi Gambaro of the Pontifical Institute for Foreign Missions (PIME) died of lung cancer on Wednesday, 16 April 1997 at Canossa Hospital. He was 72 years of age and had been a priest for 47 years. Father Gambaro was born at Scorze in the Province of Venice, Italy, on 24 July 1924. As a young boy in the Diocese of Treviso, he opted to study for the missionary priesthood and entered the PIME minor seminary dedicated to Mary Immaculate in Treviso on 26 September 1938. Moving on to the PIME major seminary in Milan. Father Gambaro made his final promise in the seminary chapel on 26 June 1949 and was ordained a priest by Cardinal Schuster, Archbishop of Milan, on 25 June 1950 in the Milan parish church of St. Stephen. Following ordination, Father Gambaro’s first assignment was to teach Italian, Latin and Geography in the PIME minor seminary in Genoa. He took up this post on 8 August 1950 and a year later was also named Vice-Rector of the seminary. After serving in the seminary for three years. Father Gambaro received his long-awaited mission assignment which brought him to Hong Kong where he worked as a missionary for the remaining 44 years of his life. Father Gambaro set sail for Hong Kong on 1 September 1953 and after 27 days of travel arrived in the colony on 28 September. He was sent to the PIME Centre in North Point for two years of English and Cantonese language studies after which he remained at the Centre for another two years as assistant priest at the chapel there. On 3 December 1957, Father Gambaro was appointed assistant parish priest of St. Jude’s Parish, North Point. Shortly thereafter on 3 June 1958, he was appointed Spiritual Director of the diocesan minor seminary in Taikulao. While at the seminary it was discovered that he had a tumor in his shoulder which was removed in July 1959, at St. Francis Hospital, Wan Chai. Contrary to the fears of his doctor. Father Gambaro was able to return to his work at the seminary the next academic year. In 1968, Father Gambaro was appointed assistant parish priest of St. Margaret’s Parish, Happy Valley, and the following year in December, he was appointed parish priest, a post which he held for almost 19 years. During these years Father Gambaro developed St. Margaret’s into an outstanding parish and was much loved by his parishioners. It was also during his time there that the magnificent parish centre which also houses the education offices of the diocese was built. In 1988, one of Father Gambaro’s cherished goals was met when St. Margaret’s parish was handed over to its first Chinese pastor. Following a short vacation in Italy, Father Gambaro took up his final post as assistant parish priest at the Cathedral on his 64th birthday. During 1996, Father Gambaro was diagnosed as having lung cancer that was inoperable. He bore his final illness in the true spirit of a missionary, continuing to work at the Cathedral until the need for special care forced him at enter the hospital where he died on the morning of 16 April. Memorial services were held at both the Cathedral and at St. Margaret’s Church and the Mass of the Resurrection was celebrated at the Cathedral on 19 April by Cardinal J.B. Wu with the priests of Hong Kong concelebration. Following the Mass, Father Gambaro returned to St. Margaret’s Parish to be buried in St. Michael’s Cemetery in Happy Valley. ◆ Fr. Louis Gambaro Extraordinary in the Ordinary, by PIME Faters. ◆ P. Luigi Gambaro - Straordinario Nella Quotidianita, A cura di alcuni confratelli del PIME, 1998.